Primer2 Tops EE Times Best Products for 2010! STM32 Primer2 Tops List of EE Times Products of the Year! 25 January 2010, Montbonnot France - With its rich feature set, ease-of-access to components via CircleOS, and a supporting online community, STM32 Primer2 won the accolades of the EE Times, topping their Products of the Year for 2009! Primer2 is the Raisonance promotional and evaluation tool for the STM3210xE variants of STMicroelectronics' STM32 ARM Cortex-M3™ core-based family. 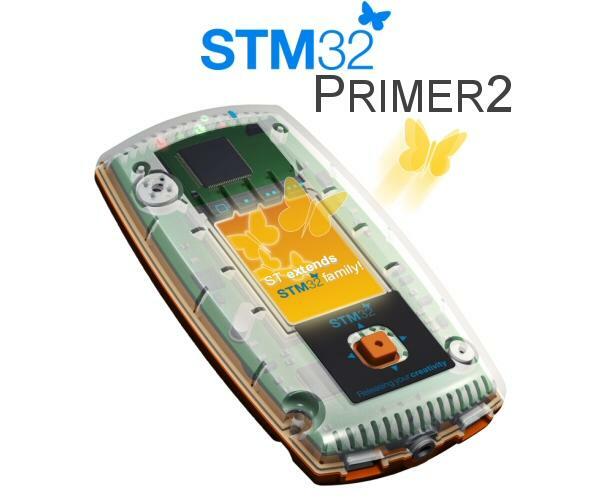 The STM32 Primer2 builds on a successful concept introduced by Raisonance for the launch of STMicroelectronics’ first ARM Cortex-M3 core-based devices, the STM3210xB. Faced with the challenge of getting engineers to just try these powerful new 32-bit devices, the Primer sought to do this by reducing or removing the typical barriers to technology adoption: learning to use the device, cost of tools, and motivation. Primers attack these problems by providing fun features that engineers want to see in their own applications, a complete but affordable hardware software toolset, a community of users to help each other along. Primer2 provides access to a range of typical peripherals (USB, USART, SPI, I2C, CAN, …) but also implement some remarkable and fun hardware features to include a touchscreen, high-quality audio, SDcard, and user controls based on a MEMS accelerometer. The platform is also a complete application development tool with an operating system – CircleOS, an integrated programming/debugging interface, a C compiler and an integrated development environment for less than $100. But it is the community, www.stm32circle.com that has boosted the Primer from a fun and cost-effective tool, to a promotional phenomenon. With the code resources and the assistance of Raisonance engineers and fellow users shared through the site forums, users have discovered support, motivation and identity as Primer and STM32 users. Now more than 11,000 users strong, “the circle” has grown to be one of the most important and active support resources on the web for STM32 and ARM-Cortex-M3. Electronic Engineering Times is a leading electronics industry publication that has served the information needs of development engineers and technical managers for more than 30 years. Selection for the EE Times annual top products listing is based on internet user views of the products on the eeProductCenter site. You can check out the complete listing at EE Times, or read more about Primer2 in the article from Catherine Mathas.